Yesterday I came home to these awesome goodies waiting on me. 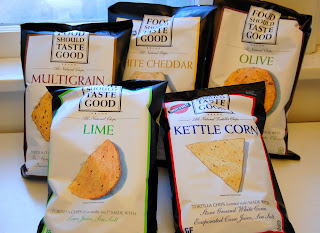 The wonderful people at Food Should Taste Good sent me a few bags of their awesome chips to try out. I love their chips and almost always have a bag of the Sweet Potato flavor on hand. The ingredients list is simple, straight forward, and gluten-free. Not only are they made with ingredients you can recognize and pronounce, they taste amazing. They have several new flavors now like the Lime, Kettle Corn, and even new Kettle Cooked flavors. The flavors are subtle, but very much there. You won't be blown out of the water and feel like you're eating olives out of the jar with the Olive flavor (as an example), but you get the subtleness of a nice kalamata olive. It's perfect. In case you aren’t familiar with our product our all natural chips are made from real, simple ingredients. All of our chip varieties are free of cholesterol, preservatives and trans fat, and do not use genetically modified ingredients (GMOs). They are also certified Kosher and Gluten Free, lower in sodium, and are a good source of dietary fiber. We currently have 16 flavors in our 5.5oz line: Multigrain, Sweet Potato, Olive, Jalapeño, Lime, Cantina, The Works!, Chocolate, Blue Corn, Cheddar, White Cheddar, Toasted Sesame, Hemp, Jalapeño with Cheddar, Hatch Chile and Kettle Corn. As well as a brand NEW line of Kettle Cooked Sweet Potato Chips with 4 classic flavors: Original, Barbeque, Salt & Pepper, and Salt & Vinegar. Ok, I'll stop bragging about my loot now. Instead I'll share with one lucky winner. Yep, not only did I get to sample some new flavors, they have agreed to let me do a giveaway. You get not just 1 bag, but 5 bags to try out. Giveaway is open to U.S. Residents through midnight March 15. I will announce the winner on Friday, March 16. Mandatory entry - Go to their site and tell me the 5 flavors you want to try. Follow me on Twitter and Tweet the giveaway including my twitter handle (@hriacobacci) and a link to this post. Blog about the giveaway and share the link here. Please note that I was not paid for my review, but given the samples for free to try. As always, my opinions will be honest and completely my own.